Keytags allow you to minimize Bill Payment errors and save time by not having you to ask customers for their phone numbers each time they come to your store to pay their Bill. 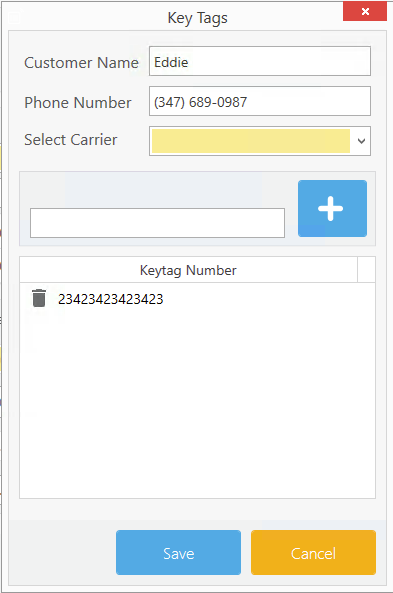 You can also use Keytags to ring-up any customer through the main dashboard by scanning their Keytag. There are two ways to do so: You can add a Keytag while doing a Bill Payment OR by going into the list of customers and adding a Keytag by selecting a specific customer. Click on the Payment tab. Enter the Customer's phone number in the Search by Phone field or enter their name in the name field. If it's a new customer you can enter their phone number in the field. Scan the Keytag in the search Keytag field. Click Yes when the Keytag not-found window opens. Once the Keytag window opens, Scan or enter the Keytag in the field and click on the Blue plus icon. Click save to save the Keytag. Click on the List tab. Then the list of Customers. Enter the name or number of the customer in the search field to search the customer. Once you find the customer, select it and click on the Pencil icon from the options menu to edit the customer. Once the Customers window opens, select the Keytags tab within the window. Scan or enter the Keytag in the field, and Click on the Blue plus icon to add the Keytag. There are many ways to use Keytags. You can use them while doing Bill Payments, or when creating a general invoice through the main dashboard. While doing a Bill Payment, you may scan the customer's Keytag in the search by Keytag field and the customer's phone number with his/her associated name will show up. Then, you may proceed with the Bill Payment. Through the main Dashboard, you may scan the customer's Keytag in the Search by Customer field. Once the customer's information shows up, you may then proceed with the transaction. Click on the Trash bin icon next to the Keytag to delete it from the list. Scan or enter a new Keytag in the field and Click on the Blue plus icon to add the Keytag. 1. Email us at sales@cellsmartpos.com informing us that you are interested in purchasing Keytags. 2. Call us at 347-391-2600 and give us your order information.